Interaksyon.com reports that Gabriel "Heart" Diño, an MS Applied Math student at the University of the Philippines Diliman, has been elected chairman the University of the Philippines-Diliman’s Student Council (USC). Diño is the first transgender to lead the student government. Gabriel "Heart" Diño in a 2011 video uploaded by UP Diliman’s Philippine Collegian. She was a councilor last year. Interaksyon.com reports that Gabriel "Heart" Diño, an MS Applied Math student at the University of the Philippines-Diliman, has been elected chairman the University Student Council (USC). Diño is the first transgender to lead the student government. <>Interaksyon.com quoted Diño, who said in a statement: "As a teenager, I endured stigma and discrimination from my classmates and peers because of my gender. And when I entered college, it was in UP where I got the opportunity to be accepted and grow. Serving the students in the student council for the past two years has been my way of thanking UP for embracing who I am." 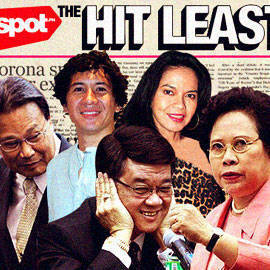 <>For more on this story, log on to Interaksyon.com.